After a couple of weeks cooped up with a pain in the arse of a tail bone injury I started to feel 100% mid week. I was partner-less and october in leavenworth can be a game of Russian Roulette...one wrong move and you could find yourself sucked in to a maze of beer gardens and lederhosen. For two weeks I had been dreaming of a perfect little overhanging finger crack finger crack up in mad meadows and so a plan formed. An unencumbered climber moving fast could enchain a number of (very) minor peaks in the icicle creek drainage. 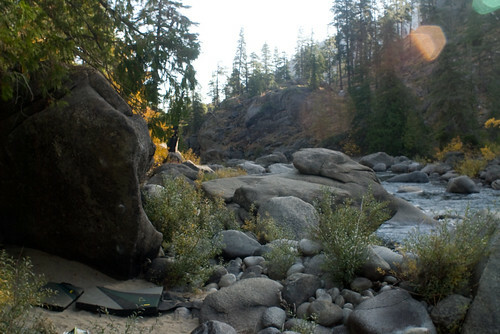 First and only bivy. 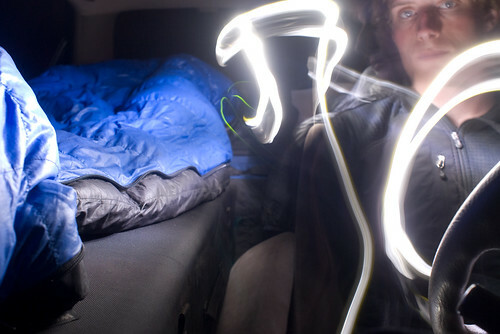 A honda accord and 3.5 crash pads make a surpassingly luxurious RV. 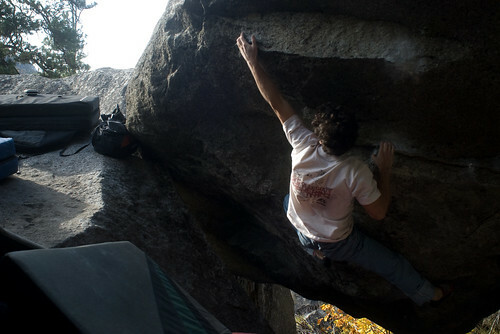 Brian from Central WA University working Mad Max, v7. For the record: Sent "No Pain No Gain" on my 3d try and "Occum's Razor" on my 2nd (had worked both for one session previously) and worked some harder stuff. 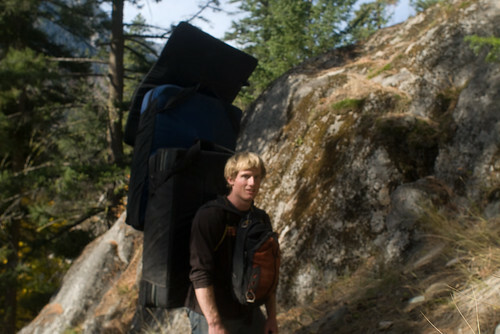 Fitz Cahall moved back to town and, without bothering to unpack, headed for the climbing gym. I spent a rainy afternoon haunting used book stores and ended up with a copy of Bryan Brudo's old guide book North Cascades Rock. 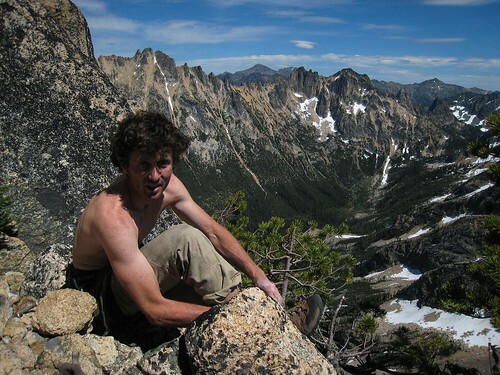 Fitz is a talented climber and writer (you need to check out his dirtabag diaries podcasts if you haven't yet). I met him working for the school paper at the University of Washington. He was a few years ahead of me and a much better climber. A coworker first told me about the Passenger. He described it as pitch after pitch of 5.11 finger cracks up the steep South East face of South Early Winter Spire. I'd filed it away as a distant goal. Talking to Fitz, my ego got the best of me and I said I'd like to get on it. An email showed up in my in box in early July; The conditions weren't getting any better. One Scorching Saturday afternoon, I loaded every small cam I owned into my car, picked Fitz up and headed for the north cascades. We got to the trail head in the early evening and hung out in the car drinking beers till the bugs died down enough to sleep. Woke up around 5am and made coffee and blasted up the trail. 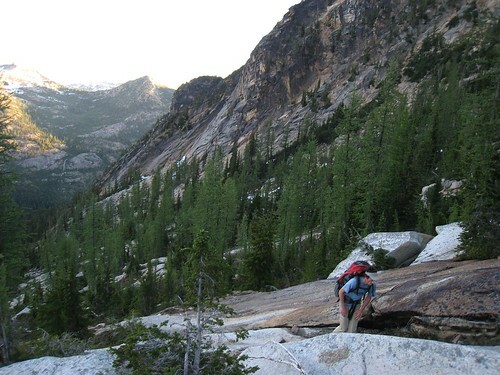 We left our packs in a tree at the base of the South Arete and were on the rock in perfect cool conditions before 7am. On route we took one 60m lead line, nuts, micros, double cams to #3 and triple small stuff, one long sleeve shirt each and one 2 liter camel back with 4 energy bars in it. I stuffed my blood sugar meter, insulin, some cliff shots and gummy bears in the pocket of my chalk bag. Fitz brought a couple of thin cordelettes and a 60mx7mm tag line. 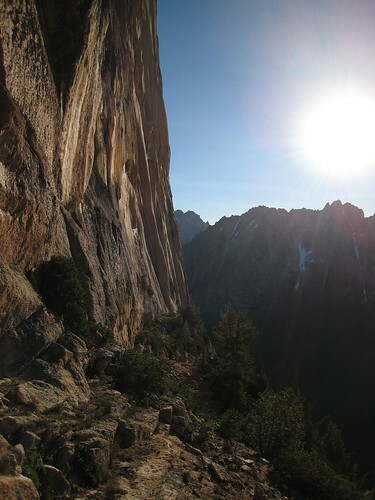 The cordelettes kept the belays really clean and the tag line reduced the level of commitment enough that we could go light on food water and clothing and leave our headlamps with the packs. Fitz lead the whole route in 7 pitches. 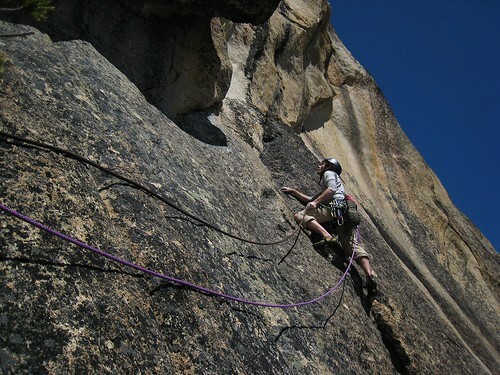 Going by Brudo's topo, He linked the crux face pitch with the pitch above (rope drag) and the last two pitches. 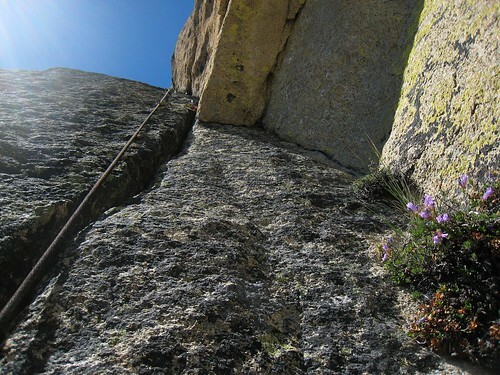 I think it would also be possible to link the 2 pitches below the crux with a 60+ rope. The crux is scrunchy face climbing and neither of us could free it. 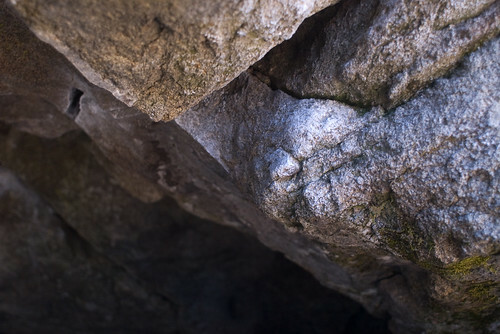 Fitz onsigted the rest of the route, i pulled on gear on the crux pitch and hung once to clean on the pitch below. Start of the 5.10 finger pitch. 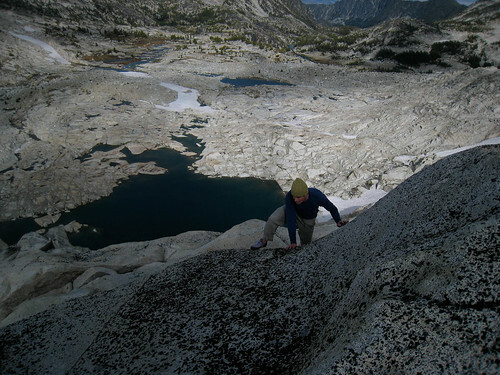 Other parties I have talked to since did a difficult left hand finger crack as the last bit of hard climbing before the finishing traverse (above the "amazing hand jams" and a now dead tree). We followed Brudo's topo and did a bit of "token wide" climbing to the right. Hundreds of feet of this. We topped out around mid day and made it back to the Marblemount Drive In in time for dinner. The best Topo for this rout is in Brudo's out of print North Cascades Rock. Hopefully he will put one in the 2nd edition of his new Mazama book, until then either check out the store copy at feathered friends or drop me a line. 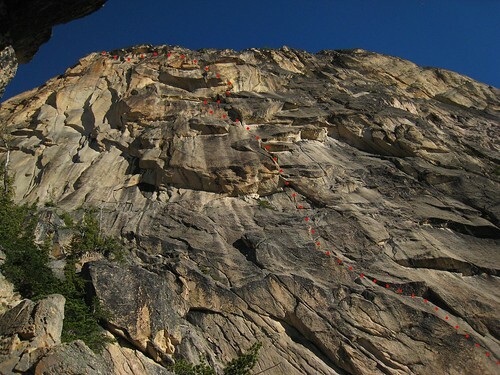 Brudo did the first ascent in 9 pitches and rated it 5.12a V, other parties who have freed the entire route felt it was 5.11+ IV. This felt more or less accurate to me but there is one scrunchy hard move on the crux pitch that may be harder for tall people like us. I'm hoping to to build up some strength and redpoint it this next year. Fitz Cahall on the top. More pics are on my flickr page. Blogs are the new media, yo, and Free the Hills is my attempt to participate. 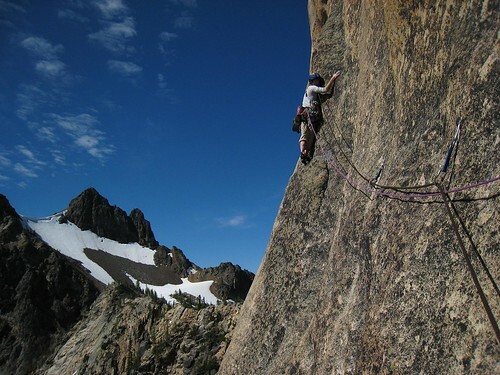 Its about a type I diabetic training for and attempting to free climb in Washington State's Cascade Mountains. I will strive to include a mix of high quality photo trip reports and well researched postings on topics directly and not so directly related to climbing. In the next couple of weeks I'll be posting often as I recuperate from a bike crash. 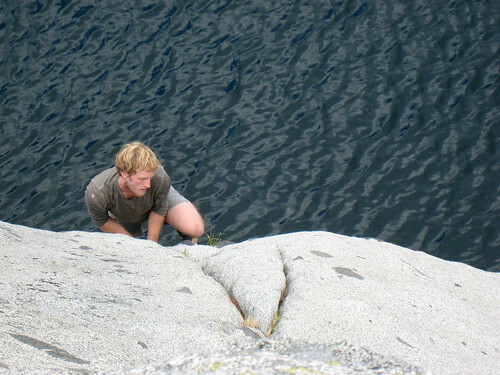 I'm planning on writing up a couple of trip from this summer, describing methods I've used to prevent and treatment of some common climbing injuries and writing a bit about climbing with type I diabetes. Braxton earlier in the same trip.